So-called “detail” photographs are some of our favorite pictures to take on a wedding day in Washington, DC. We love creating images of matrimonial rings, dresses, shoes, tuxedos, cuff links and table decorations for our brides and grooms. Why? Because we have time and the ability to set up each shot beforehand. And that means we can really flex our creative muscles. 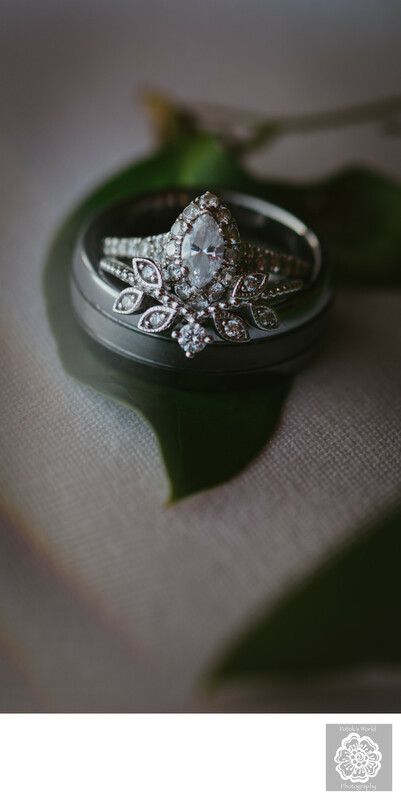 When these DC wedding photographers take pictures of details, we can make them look exactly the way we want. We can execute our exact artistic vision and give our clients photos of surpassing beauty and depth. When we are photographing moments at a marriage celebration, we often cannot choose the setting. That is not to say that we have no control over how the moments we photograph appear on film. A Washington, DC, wedding photographer can certainly use photographic techniques to influence the role the surroundings play in images. They can compose the photographs in ways that include the background or that eliminate it entirely. They can use artificial lights to transform the setting, making it seem brighter or darker. They can adjust our cameras’ apertures to bring the ambient areas into the photos or turn them into a distant blur. But when things are happening at a wedding, their control over the surroundings is limited. When a bride and her bridesmaids share a teary hug, the most important thing is getting that on film. Though it would be nice to take that picture in front of a glorious sunset, the realities of a wedding day rarely allow for it. We capture the image where and when the moment takes place. Taking pictures of details allows for an entirely different approach. DC wedding photographers have complete control over every element of the process of producing the images. There is no waiting to see how a potentially meaningful situation unfolds. There is no grappling with unfavorable lighting conditions or distracting backgrounds. There is no possibility that someone will wander in front of the camera at exactly the wrong time. Except in the case of room and table shots, we can bring the items to be photographed to an ideal location. We can pick a beautiful outdoor setting in the glory of nature. We can also choose indoor areas that can lend any number different looks to the images. Once we have selected the location, we can then arrange the details in the most visually pleasing ways possible. We can put them in spots that accentuate their beauty or that add creative dimensions to the pictures. We also can ensure that the lighting is perfect, either by the positioning or by using a flash. In short, we can make the rings, dresses or shoes look just as beautiful as the future spouses will remember them years later. The photo featured here shows just how great detail shots can look. This image provided the bride and groom a lovely reminder of how gorgeous the symbols of their union looked. We took the shot at Khimaira Farm, a lovely rural wedding venue outside DC in Northern Virginia. Because of that location, the entire marriage celebration had a very outdoorsy vibe. The ceremony took place in the shade of a verdant grove of trees. The bride and groom got ready and had their reception in Khimaira Farm’s rustic cabin-like main building. Because of the wedding had such a rustic theme, we thought that the detail shots should have a similar feel. To add some natural elements to the pictures, we placed the rings on a leaf plucked from a tree outside the main building. That also gave a nice splash of color to offset the more understated hues of the jewelry. To ensure that no other colors distracted from the green of the leaf, we set everything on a beige bit of linen. We obviously wanted the primary focus to be on the rings and the secondary emphasis to be on the leaf. To achieve that, we set our aperture such that the rest of the frame was nicely blurred. The end result was an image that any Washington, DC, wedding photographer would be proud of. More importantly, it was one that gave the bride and groom a visual reminder of their wedding to treasure forever.